Ghost Recon Future Soldier is a week away, and we've got the launch trailer to prove it. Check out Mr. Tight T-Shirt as he informs the men about a "Rogue Spear" over London. That's all the Ghost Recon crew needs to hear to spring into action! We've got soldiers sneaking, sniping, shooting, and 'sploding bad guys. Plenty of fancy gadgets make an appearance, as well. The military/tactical/action squad shooter fans should be drooling over this one. 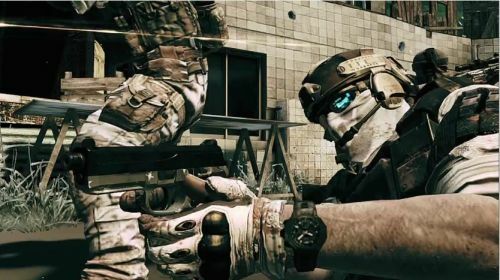 Ghost Recon Future Soldier supports two player local co-op and four player online co-op. It launches on the PlayStation 3 and Xbox 360 on May 22nd, the PC on June 12th.